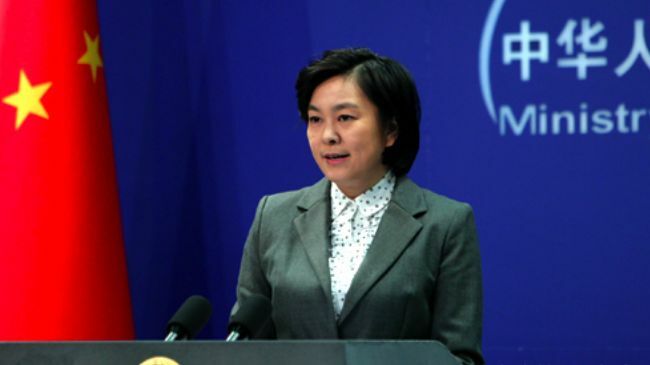 China’s Foreign Ministry spokeswoman Hua Chunying at a regular press briefing in Beijing. (TibetanReview.net, Apr06, 2015) – China has thanked Sri Lanka for denying visa to Tibet’s exiled spiritual leader, the Dalai Lama, even before the latter has received an application or taken a decision on the matter. China was responding to a Reuters report Apr 3 which quoted an unnamed top Sri Lankan foreign minister official as saying his government “may not grant a visa” to the Dalai Lama who was being invited by senior religious figures in the country. The Dalai Lama held a historic conclave with a delegation of Buddhist religious leaders from Sri Lanka in New Delhi over Mar 19-20 and the two sides suggested visits to each other to further their religious relationship. The Sri Lankan official had implied fear of offending China if visa was granted. “The Dalai Lama is very important. But the close relationship with China is more important and we have not changed our stance on ‘One China’ policy,” he was quoted as saying. Shameless autocrat regime of China acts like a spoiled kid when government of Sri Lanka acted like other puppets of China, in reality both of them have lost their moral values in the face of this world.